It may be rather telling that when you search sites of the professional coffee industry associations, not one provides information on the benefits of grinding your own coffee beans. Perhaps those in the business already know that the benefits far outweigh the savings of buying your coffee pre-ground. For them, it’s a foregone conclusion. Grind your own, they must be thinking. Why in the world wouldn’t you? That’s a good question. The benefit of pre-ground coffee is that it shaves 30 seconds off your morning routine. Yet, if coffee means more to you than merely its action as a stimulant, then grinding your own is the best—the only—way to go. Why is this so true? Nature, in one of her rare moments of prodigality, lavished upon mankind the coffee bean. Contained therein lie about 400 volatile organic compounds and oils which, when released, rise to excite and please the senses. To keep those wonderful elements preserved until needed, nature also created the outer layer of the coffee bean. The crispy exterior of the roasted bean manages to hold all the magic inside until it is cracked open and exposed. The whole bean provides a natural freshness package for our perfect storage convenience. Grinding, of course, exposes the interior of the bean, the best part, to the air. As the center portion comes in contact with the air, it reacts and oxidizes. This oxidation consists of the expelling of the aromatic compounds to the air, which is why our noses detect the intoxicating fragrance as the beans are broken apart. Alas, though, with the scent goes the flavor. Ground beans will lose nearly 60% of their flavor over 15 minutes exposure to the air. This is one reason why you must commence brewing immediately after grinding if you desire the freshest, most flavorful cup of joe. Grinding is only the first half of the equation for transferring the organic admixture within the beans into a water medium. The release of the bean’s store of carbon dioxide pushes the flavors out into the water. While some carbon dioxide escapes during roasting, much remains until it is ground. Then the leaching renews. The longer it waits to be brewed, the more it outgases. Subjecting the grounds to the water as soon after grinding as you can preserves as much of the carbon dioxide as possible for the water to extract. 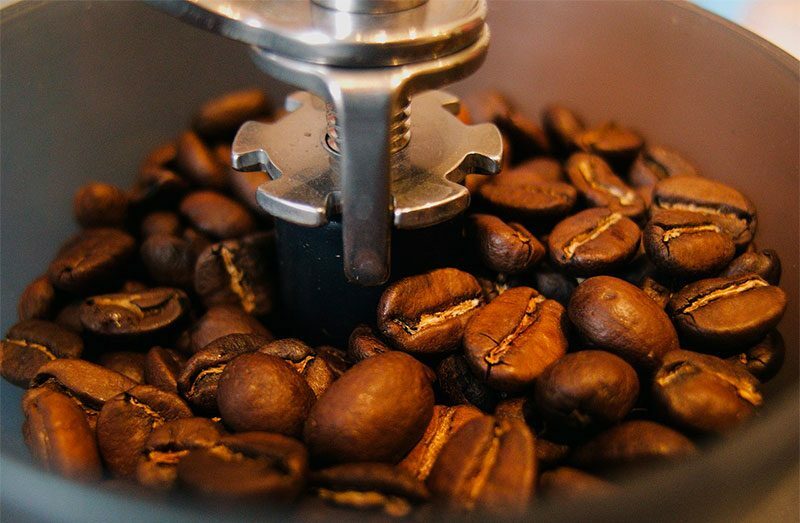 A substantial amount of flavor comes from the oils (lipids) in the coffee bean. After reducing the beans to tiny particles, moisture in the air begins to dilute the water soluble lipids. Bean oils also evaporate. Moreover, the oils attract odors in the surrounding air. The longer they remain unbrewed, the more potential for malodorous contamination of the grounds. Storing ground coffee in air tight containers makes good sense if you really must pre-grind them or buy them already ground. Cowboys just want caffeine. Coffee aficionados need total control. Since every production device calls for grinds of different degrees of fine, grinding your own is the only way to guarantee your beans will transmogrify into the perfect cup from your particular brewing system. From coarse to powder, here’s what works best for each brewing method. Benjamin Franklin must have been speaking of the benefits of grinding your own coffee when he coined his famous proverb. You lose the point of buying expensive, flavorful coffee if you buy it pre-ground, for all the reasons listed above. It makes little sense to purchase a specialty coffee, lovingly grown, harvested, roasted and transported to your local outlet if you’re going to simply grind it all up at once and store it until needed. You might as well save your dough and select an economy-sized bag of pre-ground commercial coffee at your nearest membership club. It seems as though nature’s most remarkable gift of coffee comes at a bit of a price. Because of coffee’s unique properties, preparing it for consumption causes it to simultaneously lose its freshness, and fresh is required in order to craft the best, most delightful product. Of course, if flavor takes a back seat to the eye-opening, nerve-popping blast of caffeine, you can go ahead and save that half minute off your morning chore. But if you lust after the most delicious cup of coffee you can acquire without seeking the pricey services of an experienced barista, then grinding your own beans for your home brewing method simply cannot be beat. The best part is that it smells so good and makes the entire kitchen smell like fresh ground coffee!